Recent bijgewerkte, gezellige appartement met twee slaapkamers, heeft een nieuwe lay-out!Hoofdslaapkamer bevindt zich nu in een volledig rustige kamer met uitzicht op de tuin, dus 's nachts geen problemen met het straatlawaai meer! Met geweldige locatie in De Pijp, op slechts 10 minuten loopafstand van het centrum van Amsterdam of het Museumplein (Van Gogh Museum, Concertgebouw, Stedelijk Museum) of het Leidseplein of Rembrand met veel winkels, markt en goede restaurants. Ook het Heineken Museum en de beroemde Albert Cuypmarkt liggen op slechts 5 minuten loopafstand. Zeer handige nieuwe metrolijn 52 met station De Pijp aan de overkant van de straat verbindt appartement met het Centraal Station ook en reistijd duurt 5 minuten. Appartement biedt gratis WiFi en digitale kabel-tv. Lakens en handdoeken inbegrepen, fornuis, koelkast met vriesvak, magnetron, koffiezetapparaat, broodrooster, badkuip, strijkijzer, strijkplank, stofzuiger, verwarming, kabel / satelliettelevisie, dvd-speler aanwezig. Appartement biedt alles voor een leuk en gezellig verblijf tijdens het verkennen van het prachtige Amsterdam. Spacious, comfortable, great area and excellent connections. 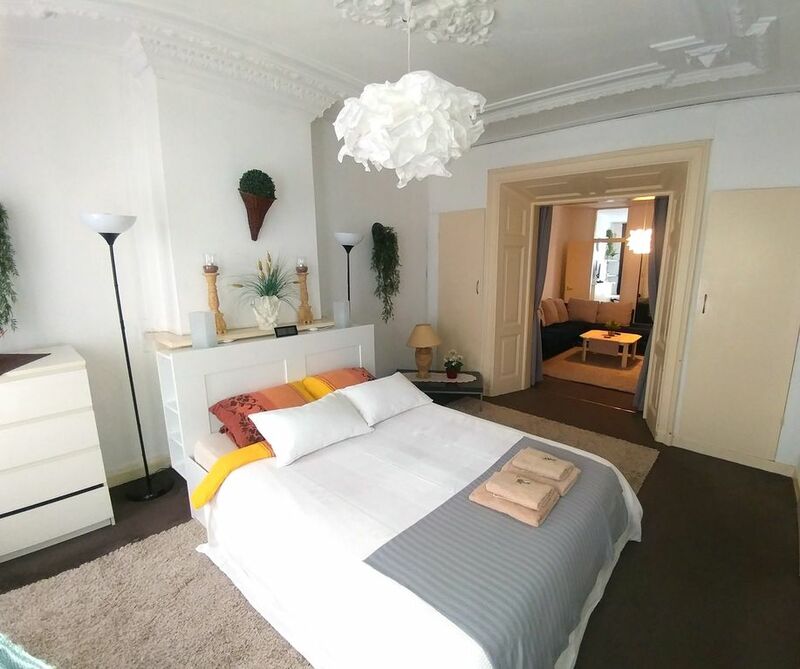 Apartment very comfortable and equipped with everything, wifi included, in an excellent area with shops for every need, close to the city center connected by metro and tram (only a few minutes to reach any area of the city), or little more if you want go on foot. The entrance stairs are very steep, in the style of Amsterdam, but it is good to keep it in mind: not suitable for children or the elderly or with mobility problems. Branko, the manager, is friendly, quick in contacts and very helpful, and his friend Matej was very helpful with check-in too. Excellent quality / price, I will keep it in consideration for future stays. If this is a newly updated apartment, I wouldn't want to see it in the before condition. As noted, stairwell is very steep. We are quite familiar with Dutch staircases, but feel this one deserves a photo and a disclosure. My husband is physically limited and these stairs were treacherous for him. Carpet is dirty and terribly worn. Living room sofa covers were covered with tiny holes (silverfish? ), very worn and unclean. Bathroom sink was cracked and badly repaired with some kind of epoxy. Washing machine inoperable. Towels and sheets were worn. Walls in the small bedroom looked like someone had catapulted out of the bed with army boots on. Dirty! Street noise was loud, but you can get used to that. However, bar noise on ground level was ridiculous. Extremely loud noises - music and people until 3-4 in the morning. Needs to be disclosed. If you want to sleep, don't stay here. This review is grossly exaggerated in order to misrepresent my place and it was probably caused by her sleeping issues. Apartment's layout had been completely changed post-stay (in february 2019),and now master bedrooom is facing completely quiet garden. No street or bar noise issues whatsoever in a bedroom anymore! Apartment is as presented in photos ,description and almost all past guests reviews ...it is well maintained , clean ,with no washing machine advertised for a reason and with steep staircase ,not suitable for disabled people (exactly as in most other old Amsterdam's city houses) ..knowing it clearly in advance and her husband's physical limitations ,why did she book it in the first place? And if she wanted to spend her Christmas and New Year's Eve holidays in a quiet way ,why rent apartment anywhere close or in center of Amsterdam? Carpet ,sofa ,towels ,walls are clean and not worn ,but not completely new ,of course. You can always find things to criticize ,if only this is your goal and your lifestyle...luckily ,renters like this don't come around often! Dear travelers ,please read all other past reviews below ,so you'll understand better ,that the issue is not with my apartment,but rather with her overly crtitical character. Tous les transports sont au pied de l'immeuble. Handicapée j'ai reussi à monter l'escalier grâce aux rampes. L'appartement est tel que sur les photos. Les chambres donnant sur la rue, il vaut mieux prevoir de quoi se protéger du bruit si on est un couche tôt. The property was nice, clean, and perfect for our stay! We really enjoyed our stay here. It had all the accommodations we needed, was located in a great area, and the property owner was very helpful. I would definitely recommend this place for anyone staying in Amsterdam for a few days! Nice and Spacious - Great Location! As described by other reviewers, the staircase to the apartment is steep and makes a sharp turn at the top... but there are hand rails on both sides. The big challenge is with carrying luggage up and down. Not advisable for small children or anyone unable to climb 40+ steep steps. Noise - As many reviewers have noted, the apartment bedrooms overlook a busy street intersection with a tram line.... If you shut the windows when you are ready to sleep, the noise is not an issue (at least for us). I found it enjoyable to drink my morning cup of coffee and watch the activity in the busy street below... Trams, people pedestrians, lot's of bikes and cars at a bustling intersection. The tram is handy, and the metro station is directly across the street from the apartment. There is a nice friendly "cheers" type bar where locals hang out next door to the apartment. There is a large grocery store a couple of blocks away. A good selection of restaurants within walking distance. There is a highly rated Indonesian rijsttafel restaurant nearby, as well as a Thai restaurant. Easy walk to the museumplein, or take the tram. The cable TV has a selection of English language TV stations. No problems with the WiFi. Decent size bathroom by European standards. Kitchen well equipped. There is a balcony off of the kitchen that overlooks a courtyard with nice trees. When we visited, there were no chairs on the balcony. The owner's friend Matej was very helpful with check-in. He was waiting for us in the apartment, and gave us a tour of the features and instructions on the appliances, WiFi, etc. (pay attention to gas stove instructions - manual igniter must be held down to light the burners). Security is good - door at street level requires a key, as does the door into the apartment. Price is reasonable, good location, comfortable apartment - we would stay here again! Thank you for writting a review and it was with pleasure to host you..i'm always glad to hear,that my guests had a good stay and would stay at my place again. Geweldige locatie, vlakbij de Albert Cuyp-markt en het Heinekenmuseum, op 10 minuten loopafstand van het centrum (Leidseplein, Rembrandtplein), op 15 minuten loopafstand van het Van Gogh Museum, het Rijksmuseum ... omringd met vele winkels, markt, restaurants, levendige buurt met nieuw metrostation De Pijp, verbindt Centraal Station in 5 minuten.